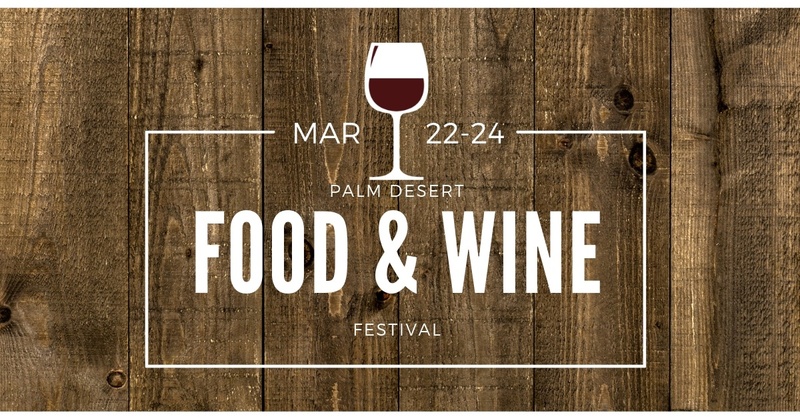 It's one of my favorite times of year, the Palm Desert Food & Wine Festival. At the Gardens on El Paseo, 73545 El Paseo, Westside upper-level parking deck in Palm Desert. Organized by Palm Springs Life, this unique festival brings the lightest and brightest inspiring chefs from across the country for three days of wine and culinary tastings. The event is held in the famed El Paseo shopping district with a host of celebrity chef demonstrations and the backdrop of the Coachella Valley is the ultimate culinary destination. There will be 40 dining restaurants and food tasting booths, celebrity chefs on three stages, 60 premier wine and liquor tastings and exquisite handcrafted beers. The weekend kicks off with James Beard Gourmet For Course Luncheon prepared by top culinary chefs and numerous experiences where you can indulge in your favorite delicious bites from local and regional restaurants. This year celebrity chefs include Scott Conant, Fabio Viviani, Gail Gand, Antonia Lofaso, Stuart O'Keefe, Brooke Williamson, Zac Young, Nick Roberts, Jamie Gwen and many more. There will be more than 60 premium and sparkling wines with a wonderfully diverse selection of the best wines in the country and the world. There will also be an array of tastings from premium liquor brands such as Ambrose Banana Whiskey, Compari, and Buzz Box Premium Cocktails. There will be over 40 local restaurants offering samplings and tastings as well as pairings from places like Cork & Fork, Adobe Grill, Burkett's Barbecue, Cattle land Restaurant and many, many more. There will be vendors to buy things from, things to see, workshops, panels, and more. This truly is a wonderful event happening each year. We'll see you there!